By Tim Royner: Former WBO light welterweight champion Chris Algieri (23-3, 8 KOs) will be facing British domestic level lightweight Tommy Coyle (25-4, 12 KOs) in a 10 round fight on the undercard of heavyweight world champion Anthony Joshua’s title defense against Jarrell ‘Big Baby’ Miller on June 1 on DAZN and Sky Box Office at Madison Square Garden in New York. ESPN is reporting that the 35-year-old Algieri will be facing Coyle in a fight that will take place at light welterweight. Coyle, 29, normally competes in the lightweight division, but he has been known to move up in weight for fights at 140, 147 and 154 in the past. Algieri is trying to rejuvenate his career following a fifth round knockout loss to Errol Spence Jr. on April 16, 2016. Algieri has won his last two fights since then after being out of the ring for two years after his loss to Spence. 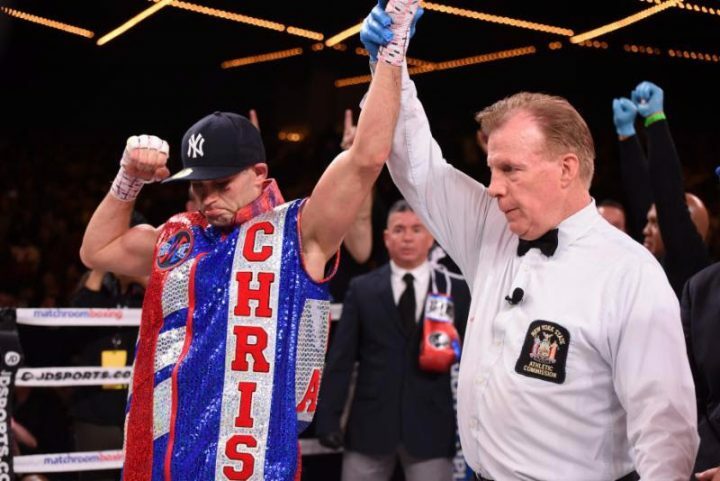 Algieri, who lives in Huntington, New York, returned to the ring last year in beating journeyman Angel Hernandez (15-12-2, 9 KOs) by a 10 round unanimous decision last November. It was a one-sided fight with Algieri winning by the scores 100-90, 100-90 and 99-91. In Algieri’s last fight, he defeated Daniel Gonzalez (17-2-1, 7 KOs) by a 10 ound unanimous decision last January. Algieri started well in that fight, but he quickly gassed out after the fourth round, and struggled through the remaining rounds of the fight. A lot of boxing fans felt that Gonzalez did enough to deserve a draw or a decision win. Algieri looked tired the entire second half of the fight, as Gonzalez walked him down and buzzed him a couple of times. This was a fighter that Algieri should have been able to dominate, but his gas tank wasn’t what it needed to be. Coyle, 29, is coming into the Algieri match with a three-fight winning streak in beating Ryan Kielczweski, Sean Dodd and Rakeem Noble. Coyle was beaten by Tyrone Nurse by a 12 round unanimous decision in 2016. Coyle also has losses to Luke Campbell, Derry Mathews and Gary Sykes. Coyle’s best career wins came against Michael Katsidis, Kielczweski, Dodd, John Simpson and Daniel Eduardo Brizuela. As of now, the Joshua vs. Miller undercard has some excellent fighters on it. Hearn plans on having WBA super middleweight champion Callum Smith, welterweight Josh Kelly, junior middleweight Kell Brook, light heavyweight Joshua Buatsi and WBA super flyweight champion Khalid Yafai on the undercard. Yafai is defending his WBA tite against challenger Norbelto Jimenez. It’s still unclear who the other fighters will be facing. Hearn is adding a lot of well known guys, but he’s not saying who they’re going to face.